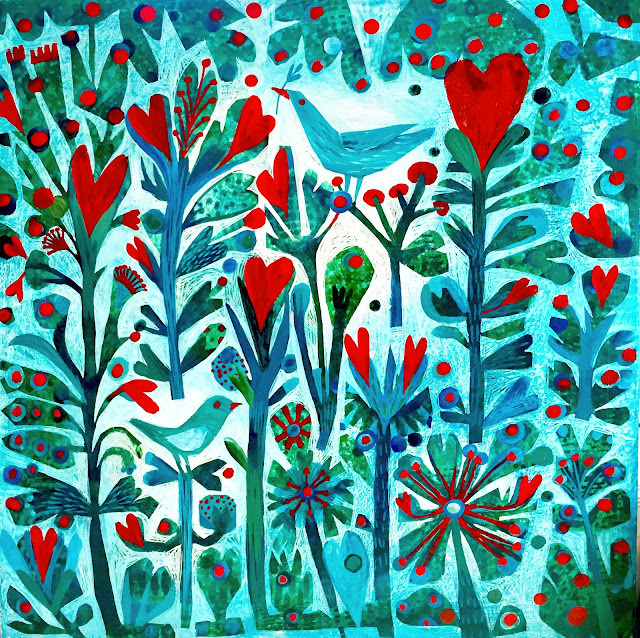 The next online painting course, Creative Leap will start on 1 February. It's the last month of 2017! The world is in turmoil and at times a bit overwhelming. For me personally 2017 was a rather tricky one, with house renovation dramas and an eye illness, but it was also a very good and eventful year and I am feeling grateful for many good things that happened along the way. I feel thankful for continued support from my family and friends, the galleries representing me in the UK and abroad, as well as people following my processes on social media and collecting my work. I love being an artist and creating paintings a bring me a lot joy! Raising funds for good causes. The 1st December is World AIDS day. This disease affect many people worldwide, in South Africa still more than 7 million people live with AIDS. I was born and raised in South Africa and support a number of charities who do valuable work there. 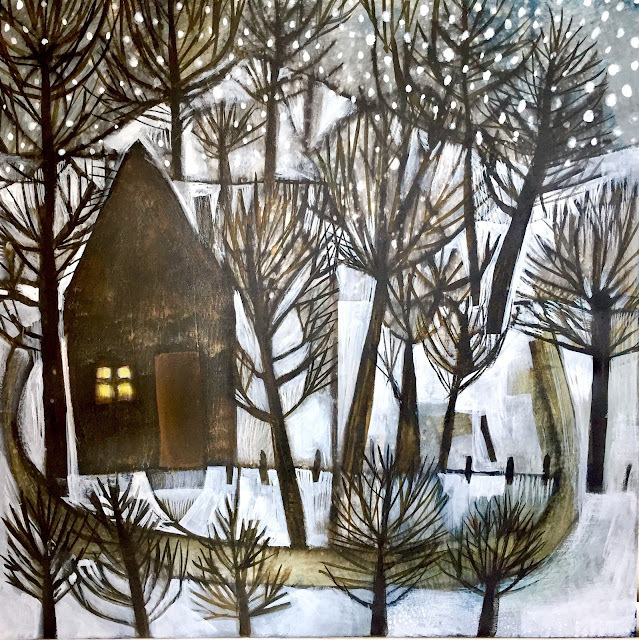 Winter Morning, the painting in this post, is a special one: all proceeds from its sale will be shared between two charities working to better the lives of children in South Africa. Starfish is focussed on helping AIDS orphans and Kungweni is an organisation close to Pretoria that supports people with mental illness and runs a separate orphanage. The painting is in acrylic on fine linen canvas. the size is 20"x24" (50x60cm) The gallery price for this size painting is £850. If you are interested in buying it, please contact me with offers above £650. The painting will go to he highest offer received by 18 December. 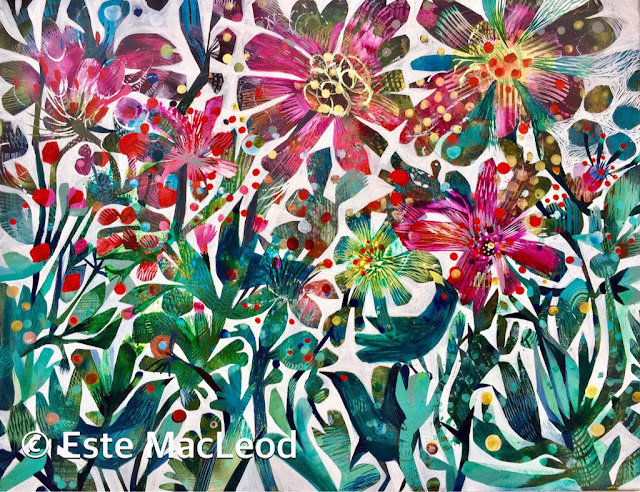 Please contact me at este@estemacleod.com if you are interested. You can see the creation process of the painting here on Instagram. I will be giving away one print of Winter Morning to a social media follower, see Instagram link for info. As mentioned earlier, this year I had a serious eye illness. It made me realise again how dependent I am on my sight and how it can be taken for granted. As the third charity that I would like to support in December, 10% of all limited print sales in my ETSY store will be donated to Sightsavers this month. See the link for more information about the work they do. 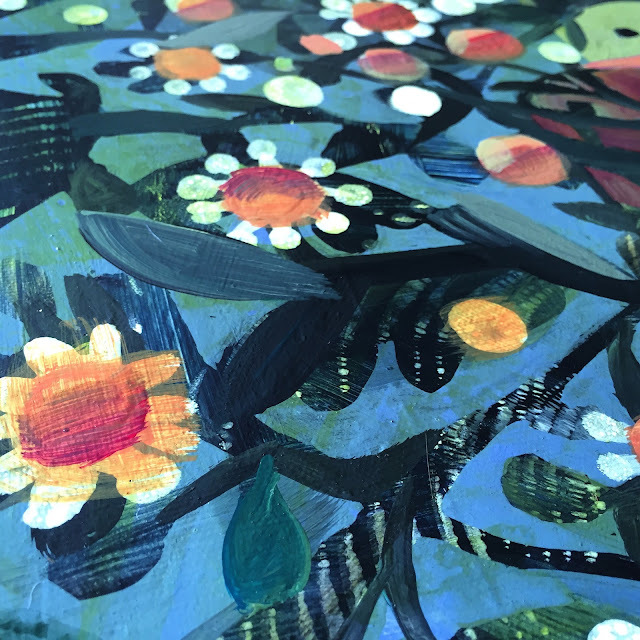 A newsletter will go out on 12 December with information on enrolling for 2018 EXPLORE COLOUR online painting and creativity courses. For me? 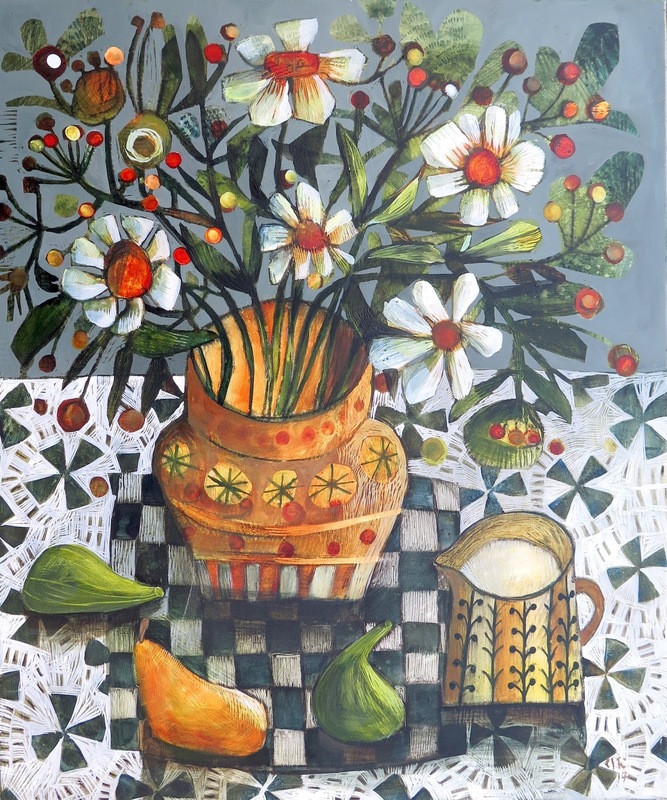 A still life painting in acrylic on linen canvas. 90x70cm. This is just a quick post about the Black Friday special offer I will be running this weekend. I sell limited edition Giclee and prints as well as some smaller original paintings and silk screen prints in my ETSY shop. There are new small and medium paintings available for global shipping if you are thinking about getting someone a special Christmas gift. From 24 to 26 November everything in my store will be discounted by 24% for orders over £90. In December I will release the dates for the next two Explore Colour Courses. After running Creative Leap three times as month long courses, I have now created a new course that will run next February. More information in the next newsletter. 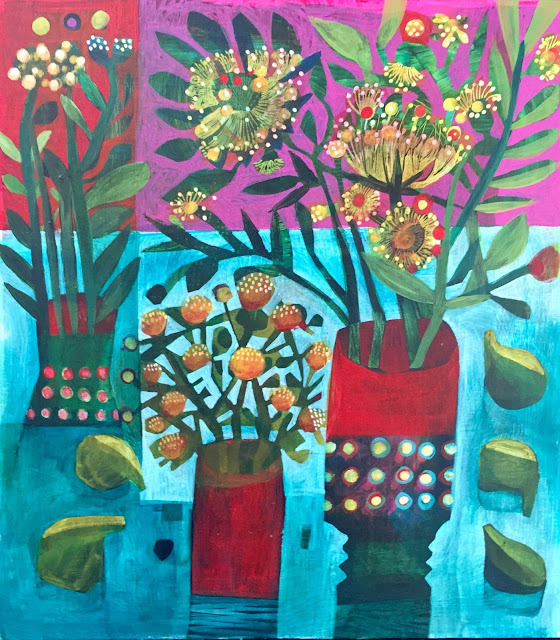 Twenty four of my paintings are currently exhibited in a number of Christmas shows in the UK, information on these can be seen in my previous Blogpost. For information on shows and new work you can see daily updates on my INSTAGRAM and FACEBOOK pages. I also occasionally do Live Demos on these platforms. New paintings can be seen in exhibitions across the UK in the coming weeks. The first group exhibition I'm taking part in will open this Saturday at Gallery Top in Matlock, Derbyshire. Towards the end of November, my work will be in a show at Iona House Gallery in Oxford and D'art Gallery in Dartmouth, Devon. 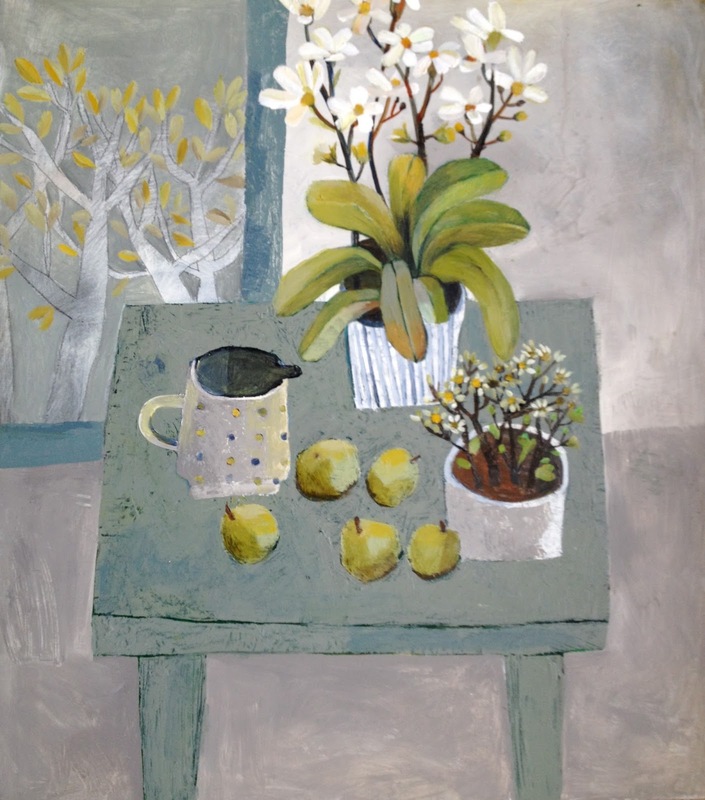 In December paintings will also be exhibited at Byard Gallery in Cambridge. Work can be seen at Red Rag Gallery in Bath and Stow in the Cotswolds, the Tiny Art Gallery in Henley-on-Thames in Oxfordshire, Golden Hare Gallery as well as Wills Art Warehouse in London where you normally can find an assortment of my still life and floral paintings. The television program DIY SOS is a BBC production about home improvement for special circumstances. Earlier this year I was contacted by the producers and asked if I would like to be involved in the current series called Veteran Street. Eight of my images were used as prints by the interior designers to brighten a property redesigned for an army veteran. A selection of my paintings are available as limited edition prints as well on ETSY for international shipping. Look out for original paintings as well, occasionally one or two are available in my ETSY shop. At the end of the month on 24 November a Black Friday sale will contain some special offers in my ETSY shop. I will send a newsletter out closer to the time. Ever so often there are giveaways on my Instagram and Facebook page. Recently one of my prints, as well as two sets of greeting cards were up for grabs on social media. Daniela Glassop and Nada Delore each with a set of four greeting cards. Follow me on social media for daily updates, occasional live demo sessions and giveaways. The school holidays have just began in the UK. 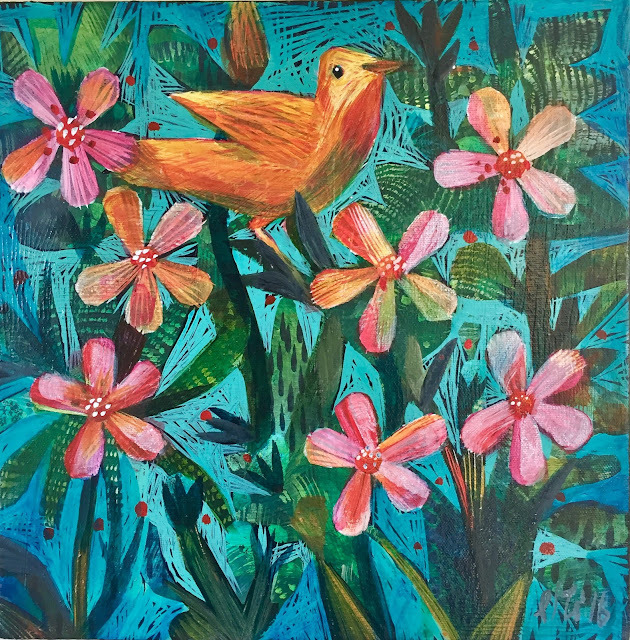 I do enjoy the longer summer days and in the last few weeks I have been inspired to create new floral and bird artworks as well as bold colourful still life paintings. Some of these images are now available on products such as dresses, cushions and scarves on Redbubble. Orders are shipped worldwide, look out for Monday special discount offers. For those who follow me on Instagram! I will be giving away a personalised watercolour artwork created from a name. This is to be given to someone nominated by a friend. The winner will be picked on Sunday 24 July. To enter the draw find the round painting post of 8 July for details. 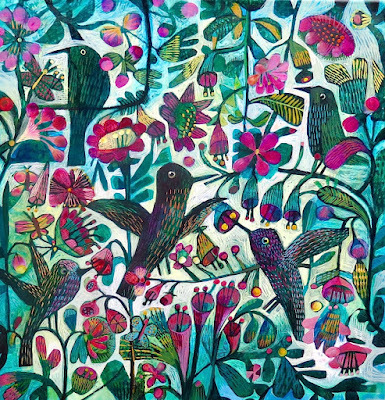 Hummingbirds 50x50cm acrylic on linen canvas, available as original painting, limited edition print, and on a selection of printed products on Redbubble. In September, new ranges of my greeting cards and notebooks will be available in Etsy as well. I am currently working on a new body of work for two Affordable Art Fair events coming up in September and October. 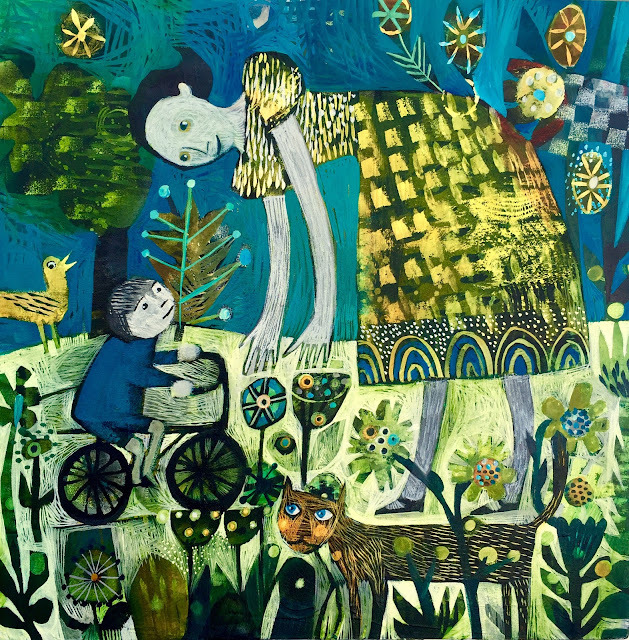 Bristol Affordable Art Fair will take place from 8 to 10 September followed by the Stockholm Affordable Art Fair from 12 to 15 October. 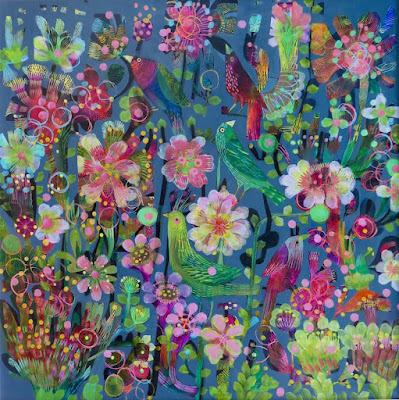 Summer joy 100x100cm, acrylic on linen canvas. Available from Red Rag Gallery in Bath. Also available as limited edition print and on products on the Redbubble site. 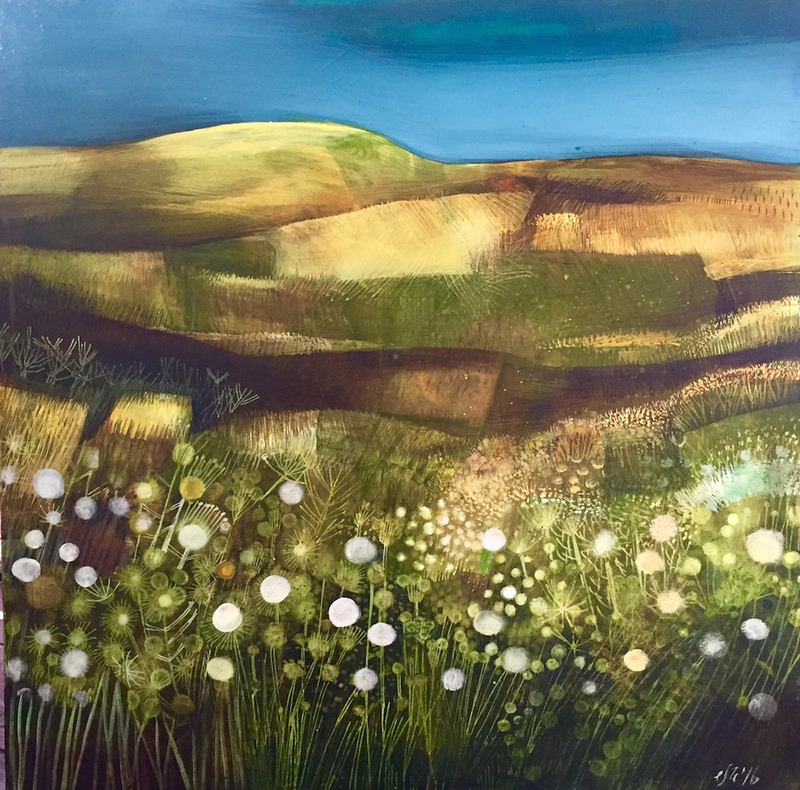 In addition to the two Affordable Art Fairs where I am represented by Wills Art Warehouse, I will be exhibiting paintings in gallery shows in London, Oxford, Dartmouth, Bath and Stow. More information to follow in August. Apart from making paintings, I am currently working on completing a book based on my Creative Leap Art Course, as well as a brand new Explore Colour painting course, to be released early 2018. From 29 April to 1 May there will be a discount of 15% off everything in my ETSY store. A bit of fun. I'm having a giveaway on my Facebook and Instagram pages. 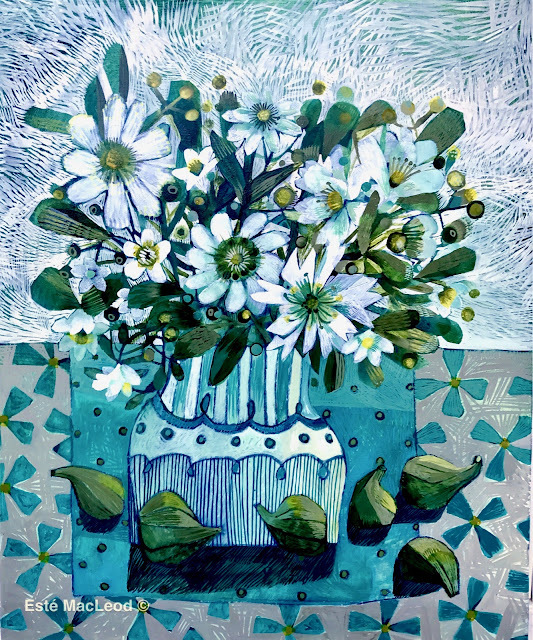 To win a print of 'Merry May' follow the Facebook link. The will be exhibitions in London, Henley, Goring and Derbyshire in the next two months - more information on this coming up shortly. Here in England it is wintery and grey with a frosty February still on the doorstep, but this one is going to be a fun one. Why? It's a month filled with little creative projects to inspire and enthuse! The course starts on 1 February and is the only Creative Leap course offered in 2017 before it will become a publication later in the year. 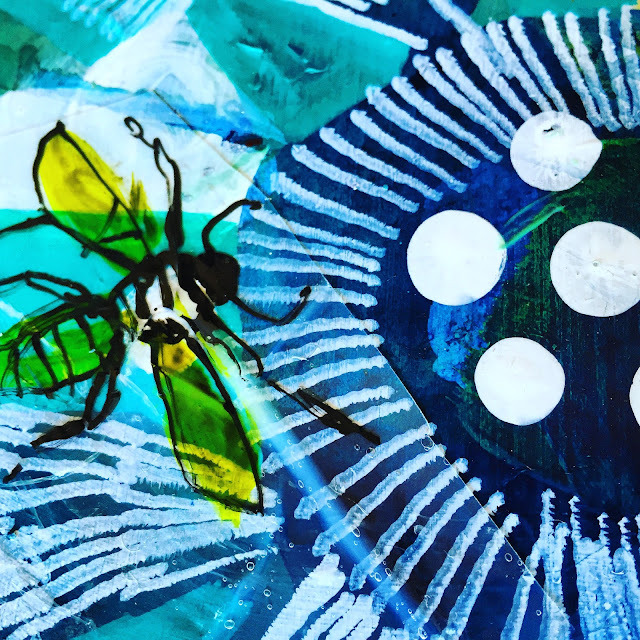 This alternative art course consists of twenty six mini projects and four bigger art projects designed to kickstart creativity and promote original thinking. 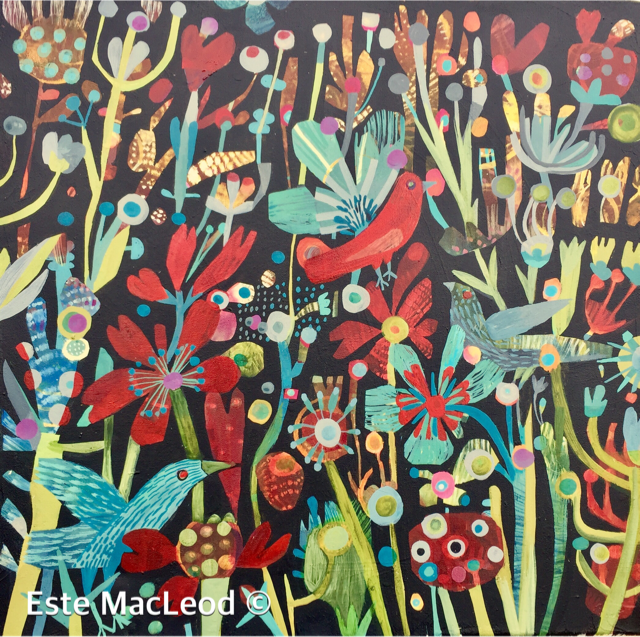 For the month of February, creative projects linked to a wide selection of themes connected to the letters of the alphabet will be shared on the Explore Colour course page daily. Familiar symbols and shapes are the links to promote out of the box thinking and enticing ideas to expand your creative practice. Key elements in this course are observing and drawing. The course is designed to expand concepts of thinking and observing by means of bite size daily exercises. Over the weekends Este will also be offering live demonstrations of the bigger art projects explaining different art techniques. These are linked to the precious week's mini projects and are an optional addition to the basic course. The live demos will happen every Saturday during February for an hour, within a Facebook private group exclusively for Creative Leap participants. This course is suitable for artists and designers of all levels and experience. The course is created to promote individual development and experimentation, useful as a daily exercise or to be done in more depth over a longer periods. PDF documents can be downloaded to do the projects at a later stage. Creative Leap costs £95 and registration closes on 31 January. Over the last few months I have been working on new paintings for exhibitions and events coming up. Other galleries where my work can be seen at the moment include Red Rag Gallery, Golden Hare Gallery, Gallery Top and The Biscuit Factory. 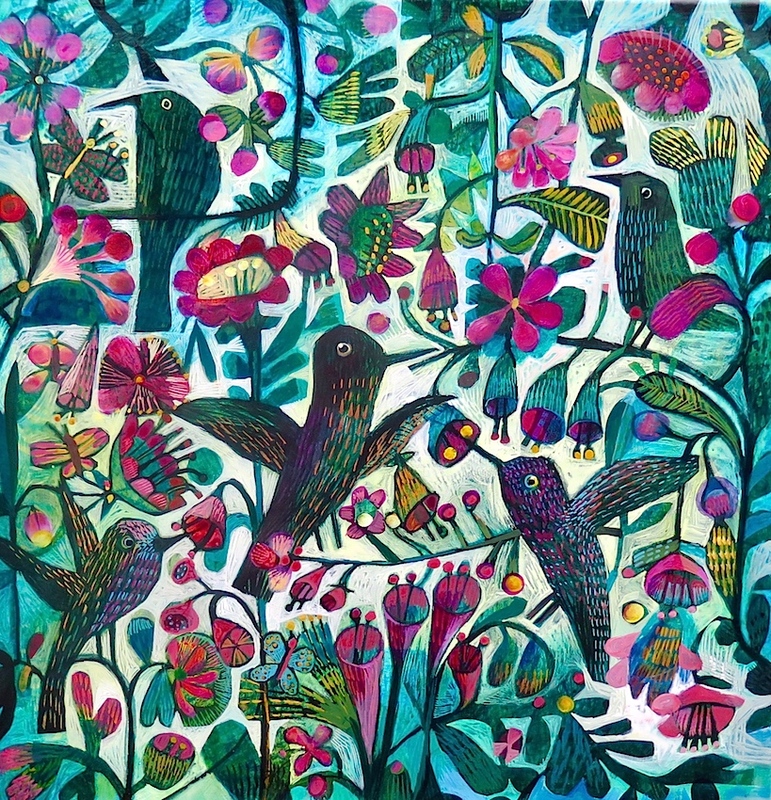 Prints are regularly added to my Etsy page, and cushions are available from Wraptious. I am doing a year long creative challenge, posting daily drawings on Instagram along with new projects and paintings. Wishing everyone a Healthy and Happy 2017! 2016 was a very productive year, and 2017 will probably be similar: apart from several gallery exhibitions and fairs in Europe and the UK where I will be represented by Wills Art Warehouse, I am having my annual Open Studio event over the last weekend of April (the Bank Holiday weekend in England). I am very excited about the hand painted needlepoint designs from a selection of my images that now available from Melissa Shirley. 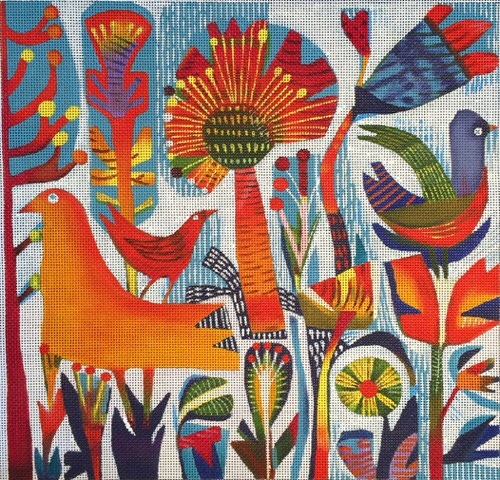 Wraptious will shortly be releasing their new catalogue where six of my paintings will be available as cushions. There are a few more collaborations in the pipeline, including wrapping paper, textiles, kitchenware and a book publication... more on this later. Apart from bigger projects I will also be doing daily postings on my Instagram account of little drawing based on random facts, notable dates, people and other things that take my fancy. 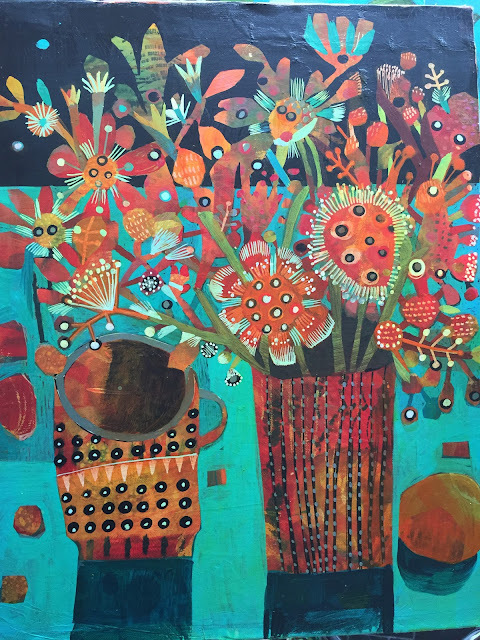 Creative Leap and Explore Colour: The Still Life Course can now be booked with an early bird offer until 3 January 2017. I am also working on a new course to focus on new art techniques and different acrylic mediums using Golden's A-Z paint sets. Dates for this course will be released in coming months. 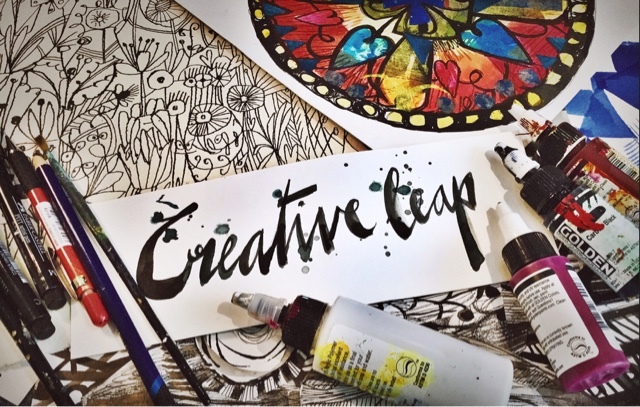 Creative Leap is a month long course suitable for anyone regardless of artistic ability. 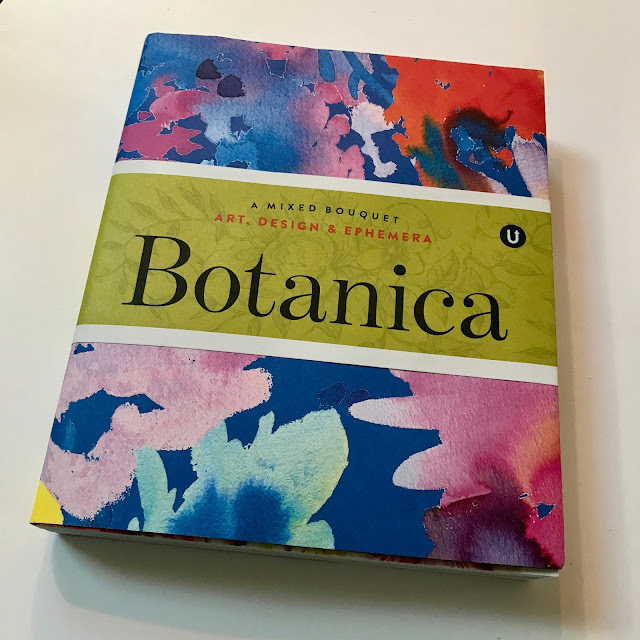 The course can be done in a sketchbook with pencil, pen, watercolour or ink, but it can be done more intensely as well using materials demonstrated in artworks. The course will make you explore alternative ways to observe and create. You will develop your drawing ability and artistic vigour. In addition to the twenty six daily mini projects I will be giving live demonstrations on the weekends within the exclusivity of the Facebook closed group. On Christmas day I created a prize draw on my Facebook page - I invited people to comment on the video post of the day and have drawn the two winners. Congratulations to Debbie Carter who said she'd like to do the course with Carolyn McGill. Both win a place on the upcoming Creative Leap course. I will be giving away another place on my Instagram account. 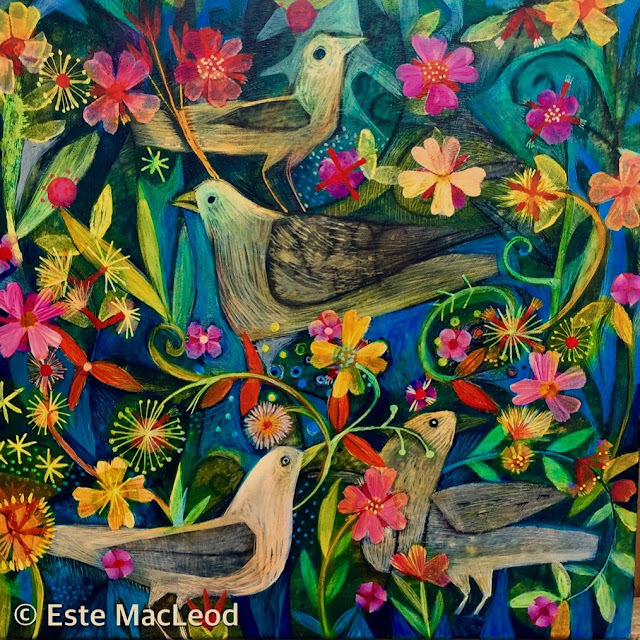 Follow #estemacleod for daily updates. Every year I donate some paintings to fundraise for causes close to my heart. Starfish Greathearts is a wonderful charity working in Southern Africa with children affected by AIDS. Oleander is a 30x30cm original painting on canvas. During the annual London wine tasting event on Thursday 3 November, this painting will be auctioned, bidding starts at £280. All proceeds will go towards the charity. If interested please contact Starfish directly. After spending more time this year doing experimentations with painting techniques and mediums, I launched the new Explore Colour Still Life Course in September. 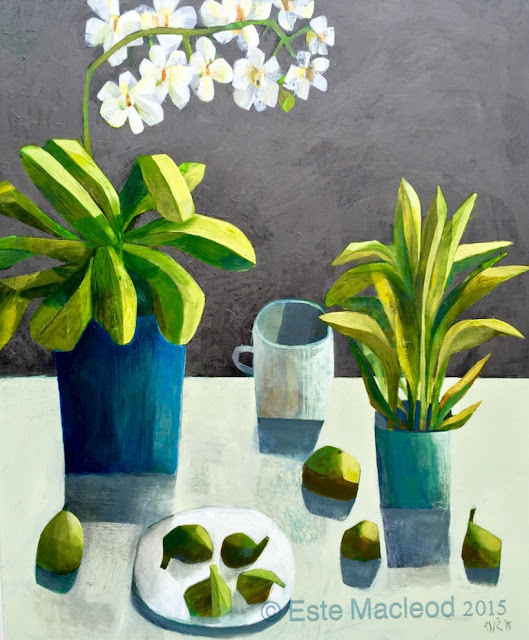 This five week course was focussed on exploring different paint techniques, compositions, colour and new ideas to be applied to four still life painting projects and future art projects. I really enjoyed seeing what the students created in response to the projects, tutorials and guidelines. This course will be repeated in 2017 with dates announced in December. November is going to be a busy month with Winter and Christmas exhibitions starting, as well as the Windsor Contemporary Art Fair from 12-13 November where I will be artist in residence. I will guide an interactive art project over the weekend. Art fair visitors are invited to create colourful mini mandalas on a large canvas by means of drawing, printing and painting. New work will be available at several galleries, including The Biscuit Factory the UK's largest independent contemporary art, craft and design gallery. 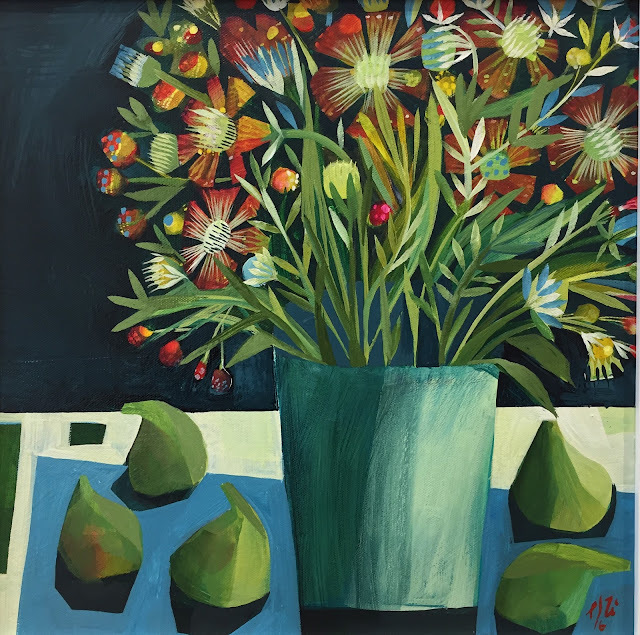 Red Rag Gallery, Wills Art Warehouse Byard Gallery, Gallery Top and Golden Hare Gallery will be showing new still life, landscape and floral paintings. Christmas 2016 - looking for something special? Limited edition prints are available in my ETSY store. New greeting cards and notebooks will be added to the site in November. For daily updates, follow my Facebook page and Instagram account. A new online painting course this Autumn. As a GOLDEN artist educator I enjoyed experimenting more with painting and layering techniques in order to developed a new painting course. The online course is extended to four weeks in order to fit in more content, it replaces the sell out Chaos to Calm course of 2015. Why do I teach art in this way? Online courses offer a very different way of learning, with time being the biggest advantage. I am able to fit much more content in an e-course than in a weekend long painting workshop. People can view the tutorials and do the projects in their own time within the four week long course. The option to revisit projects afterwards for another eight weeks is an added bonus, allowing more time to repeat projects or use techniques for different art projects. To aid with communication and feedback, there is a dedicated Facebook closed group, acting as a virtual classroom. Students from all over the world do the course, and this is yet another added element to the course. People can post work in the group page, ask questions, and see what their fellow students do in response to the different projects. A live element is now added with two live periscope sessions being offered where I will also demonstrate techniques used in the projects. See below more information on the upcoming course. 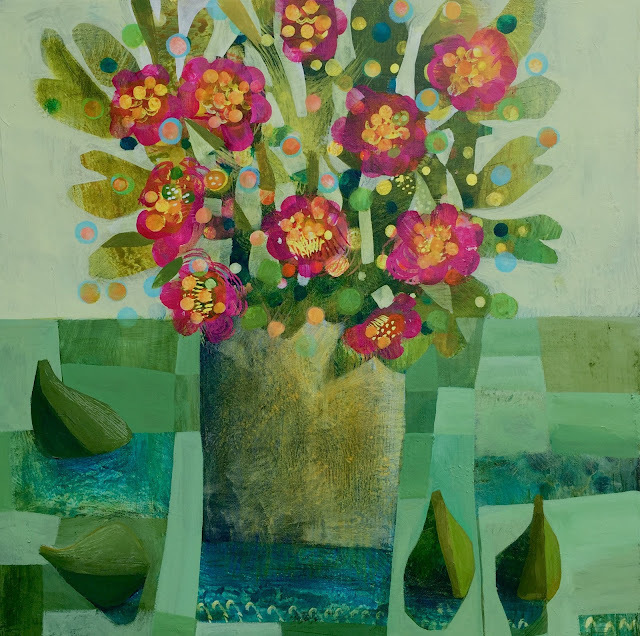 Explore Colour: The Still Life Course. This four week long art course consists of a collection of still life themed projects. 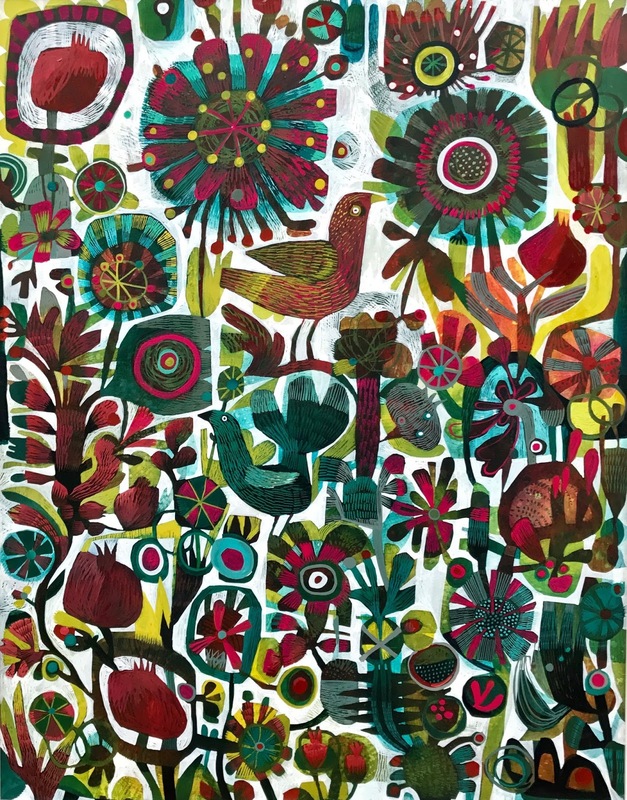 There is a strong focus on using drawings created in alternative ways, for inspiration and combining them with a variety of painting techniques to create expressive paintings. 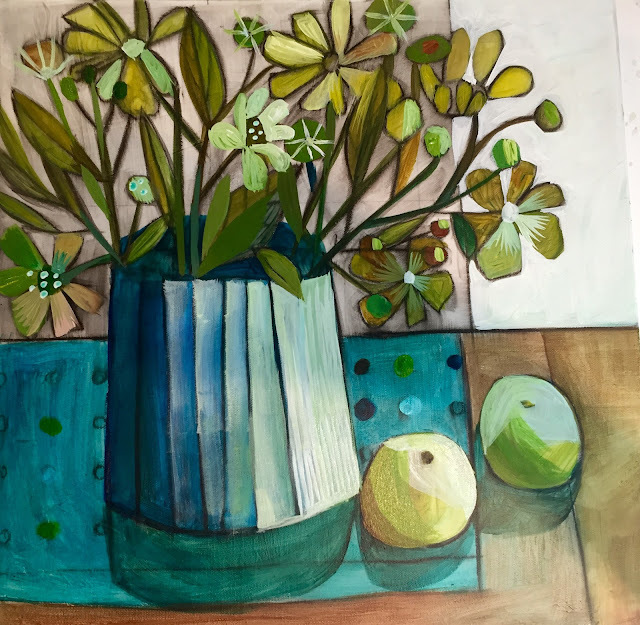 Colour is also a vital component of this course, used within the theme of still life painting in order to push boundaries and explore creative possibilities. 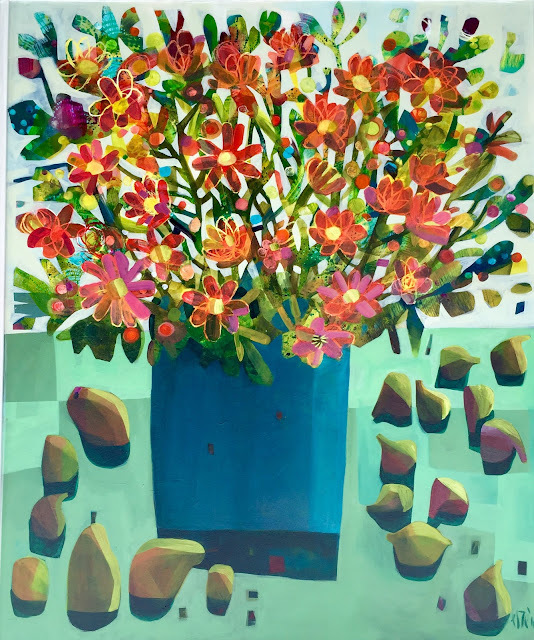 Over the four weeks, students will explored painting and creating techniques within the different projects linked to a still life theme. Developing of individual artistic styles are important, with colour exploring and a range of painting techniques explained in various demos. The limited selection of GOLDEN fluid paint, as found in the principal set of 10 colours, is used in all the projects. 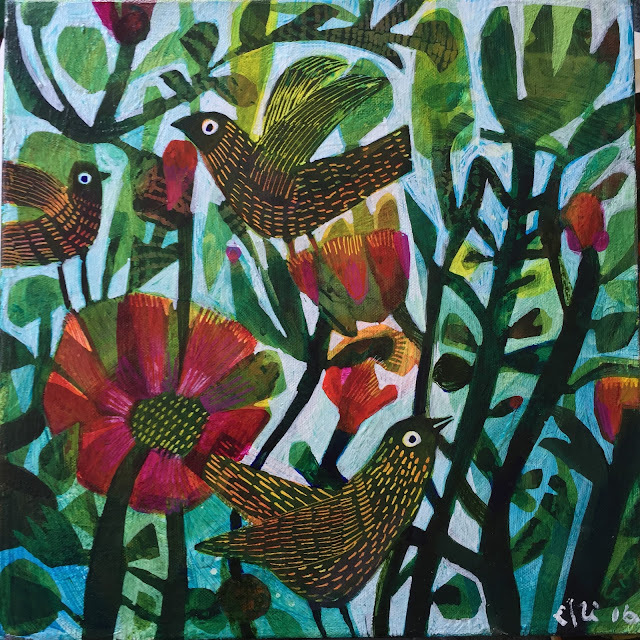 Este will demonstrate how she uses it in her own paintings to obtain ‘visual texture’, paint in layers, do printing and stamping techniques as well as drawing, collaging and mixed media projects. Video painting demonstrations are used to explain techniques and ideas. Alternative drawing projects are used to discover or develop creativity in new ways. New projects added to this course explore composition and colour moods, different painting styles and additional applications of layering and techniques including acrylic skins. 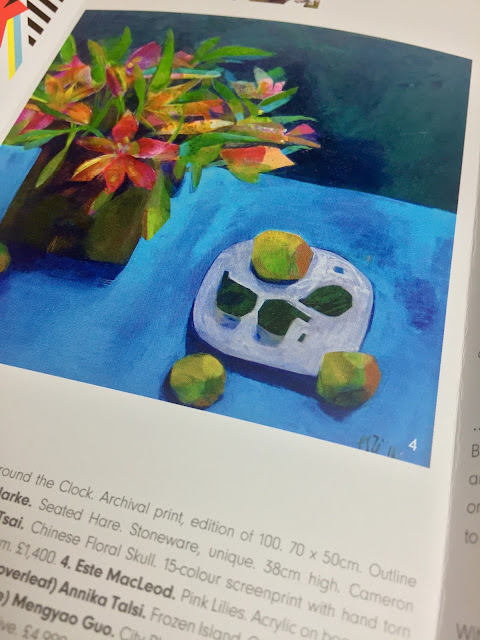 ‘The Still Live Course” sticks to a general still life theme in order to keep the focus on developing painting techniques and the basics of colour theory to discover possibilities that will be useful for individual artists; practices, regardless of their style of subject matter. Artists of all descriptions will benefit from this course, regardless of ability and experience. 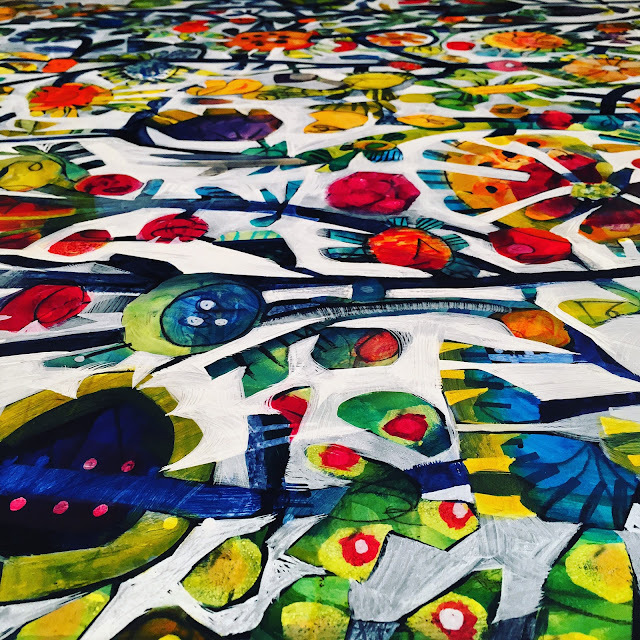 If you love colour, want to develop your range of abilities, from colour sense to painting techniques, this month long course might just be for you. A class portal on www.explorecolour.com will be accessible with a password. Video demos and instructions will be posted from this page. A Facebook closed group page will be available to act as a virtual classroom where work can be shared, for questions and general communication. 5 September: Course starts with a first week dedicated to exploring alternative drawing exercises to create reference materials. Mark making with the different paint brushes and materials will be demonstrated. 12 September: Colour and Composition. Week two, The limited colour range of the principal FLUID set will be used to create a wide spectrum of colours. 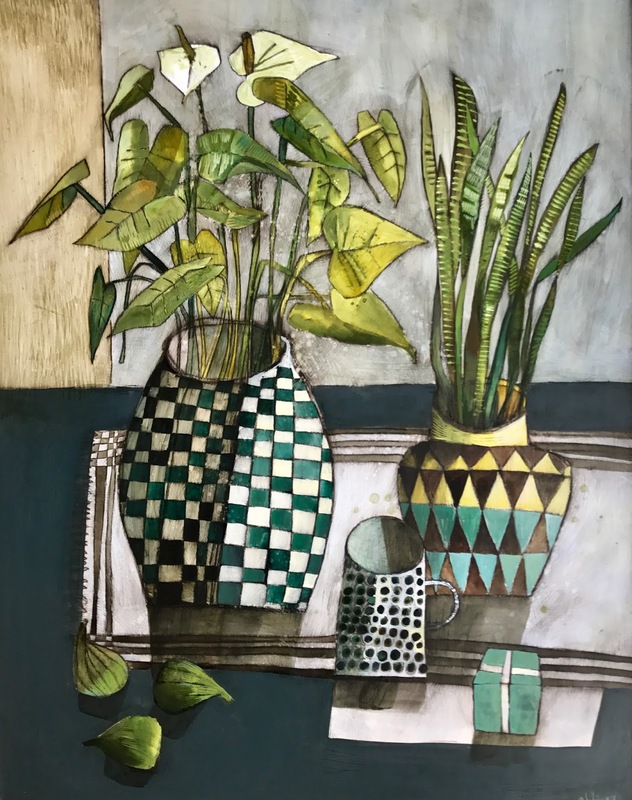 A new way of exploring different compositions is introduced in this course with added projects, using elements of collage. Project one: Painting and colour moods. Project two: Paint it your way, using techniques to develop your style. 25 September: Do more with paint! Project three: Printing and scraffito techniques using acrylic gel and medium. Project four: Layering and mixed media, new ideas to be more free. If you can write, you can draw! 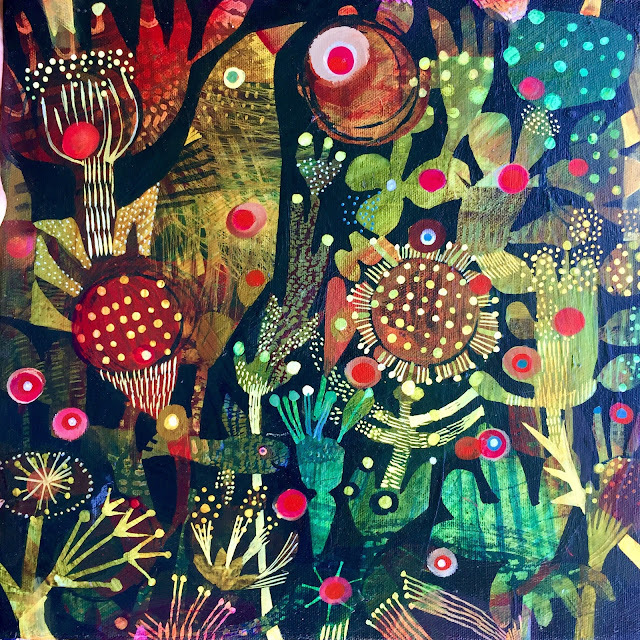 The course is suitable for all kinds of artists and designers with any age or experience. I'm currently working on the creation of a Creative Leap publication, a workbook or creative guide of sorts, so this is the last time the course will be run with video demonstrations and a closed classroom group on Facebook. So join in; escape some of the madness of this world and make your own magic! Register now and receive a £20 discount to spend on a brand new sketchbook or treat yourself to some art materials. Course fee now £75 including the £20 discount. This wonderful event happens again from 14-17 July at Waterperry Gardens close to Oxford. Come along to this unique and vast art fair, a wonderful day out for anyone interested in art, craft and creativity in the wider sense. Over the four days I will be one of the artists in residence, demonstrating techniques and materials I use in my practice as painter. I am really looking forward to be part of this energetic, vibrant event. In September 2015 Chaos to Calm was launched as an alternative still life painting course with a strong emphasis on colour and painting techniques. This online painting course is available again in a new format, altered slightly to offer more time for different projects, and more emphasis on developing individual styles. 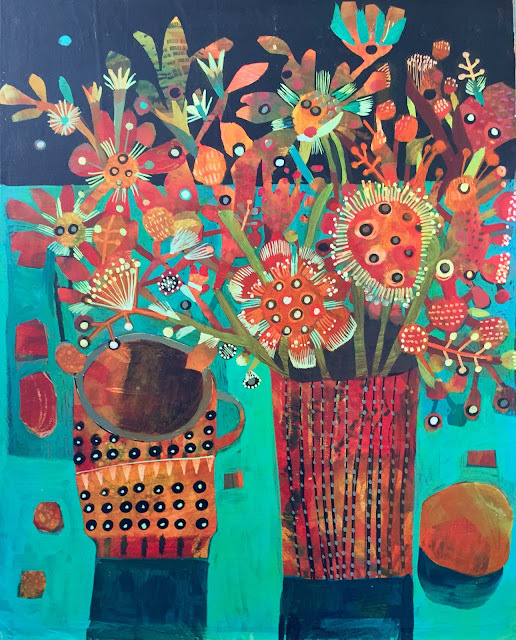 Explore Colour - The Still Life course will run from 5 to 26 September. Cost for this course is £185 and an early bird discount of £25 off will apply until 9 July. You can register interest here, to be added to a dedicated mailing list.